Interfaith Community Services welcomed the Little Caesars Love Kitchen back to our Escondido Betty and Melvin Cohn Center headquarters on Monday, June 27th for the third year in a row as they made over thirty pizzas for the homeless and clients of Interfaith’s programs and services. 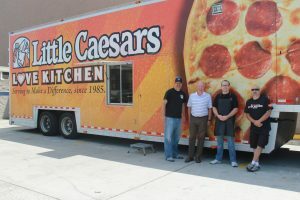 A pizza kitchen on wheels, the Little Caesars Love Kitchen travels across the continental United States and Canada, meeting the needs of the hungry, the homeless, and disaster survivors. The Little Caesars Love Kitchen has fed more than two million people in 48 states and four Canadian provinces. It has also responded to disasters such as the tornadoes in Oklahoma, the hurricanes on the Gulf Coast, the site of the World Trade Center attacks on September 11, 2011, and many more. Established by Little Caesars in 1985, the Love Kitchen exemplifies Little Caesars tradition of giving back to American communities. Local Little Caesars franchise owners and company regional offices donate all food and labor costs for the Love Kitchen servings. An estimated 50,000 Little Caesars franchise owners and employees have volunteered their time over the years to support the program in their local communities. Interfaith thanks the Little Caesars at 711 S. Escondido Blvd. for nominating our organization for the donation, as well as for staffing the kitchen and providing the ingredients to service our clients. We appreciate their time and efforts and look forward to continuing our relationship with the franchise!